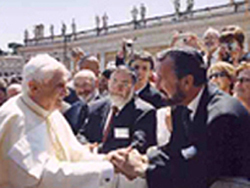 On November 3, Rabbi David Rosen, the American Jewish Committee's international director of inter-religious affairs was invested with a papal knighthood. 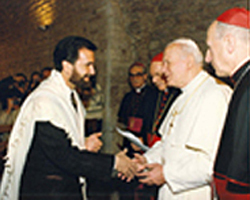 Cardinal Walter Kasper, president of the Vatican commission for relations with Jews, conducted the investiture that made Rosen a Knight Commander of the Pontifical Order of St. Gregory the Great. What I would like to know is whatever happened to the end of Matthew's Gospel where Jesus told His disciples to convert the world to the one true faith of the Church that He founded upon the rock that is Peter for salvation's sake? Has the Vatican II Church excised these verses from the New Testament? Just what is it about the One True Triune God, The Blessed Trinity, Father, Son, and Holy Ghost, that Cardinal Kasper, and the rest of the ecumaniacal interpreters of Nostra aetate (including its author) do not understand? It is Catholic dogma that the Creator of Heaven and Earth is the One True Triune God, a doctrine conspicuously missing from Nostra aetate. How can a papal knighthood be conferred on a non-Catholic who denies this dogma of the faith? Did St. Isaac Jogues and his companions, the heroic missionaries in North America who gave their lives to convert the Hurons, die for no reason? And what about the rest of the holy martyrs who died defending the one true Religion? Has it not occurred to anyone in Rome that giving papal knighthoods to Jews makes a mockery of the blood of the Martyrs? After all, Vatican II did away with that, according to Kasper, who evidently cannot see that doing away with "conversion necessary for salvation" is doing away with Catholicism. Period. The truth of the matter is that Catholics, since Vatican II, have been wandering in a desert of dissension in a Church rife with confusion just as the Israelites physically drifted in circles in the desert after worshipping the golden calf. This is a Church where the "natural" has replaced the "supernatural" as the main priority in a vain search for a "Masonic New World Order earthly utopia" – a lie of the Devil who never sleeps, prowling the world like a raging lion for the ruin of souls. In short, this is the Syncretistic Indifferentist Church of Walter Kasper that is unrecognizable as Catholic! We must pray for a Pope who will put a stop to the theological madness of the Kaspers in the Church instead of encouraging more of the same.